The patient presented to our office complaining of raw areas in his mouth. The patient is a 57 y.o. male with a negative medical history. 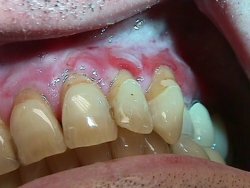 Examination revealed gingival recession, erythema, ulceration, and edema. Histopathologic examination revealed subepidermal separation. The patient did report the occurrence of a vesiculobullous lesion on his lower extremity.